Offering you a complete choice of products which include multifunction chirag next-gen block machine, multifunction chirag next-gen concrete block making machine, multifunction chirag next-gen brick making machine, multifunction chirag next-gen paver block making machine, multifunction chirag next-gen hollow block making machine and chirag multi-purpose block machine. 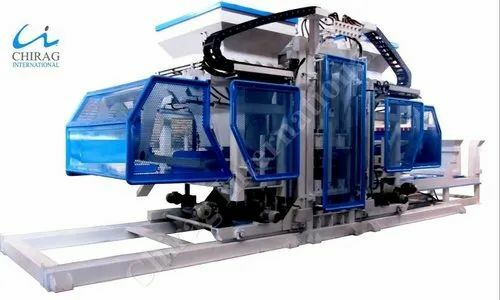 The Multifunction Chirag Next-Gen Block Machine forming machine is newly developed by our company, is a special equipment for producing building blocks. The machine can use fly ash, slag, coal gangue or other industrial waste residue and river sand, gravel, cement and other materials to produce hollow blocks, perforated bricks, curbs, pavers and grasses of various specifications by changing the mould. Concrete products such as bricks, ring tree bricks, and slope protection bricks. Plus fabric fabrics can also produce layered products. maintenance is not required, thereby saving the input and maintenance of the pallet. The main frame of Multifunction Chirag Next-Gen Block Machine forming machine adopts detachable vertical double frame structure, which is made of super large and strong steel. It is strong and vibration resistant and has good reliability. It adopts indenter and stripping double clamping method to ensure reliable movement of product removal and swaying. The structure, the fabric is fast and uniform, the product strength error is very small, the stability is high, and the scrap rate is low. The automatic process uses advanced foreign PLC (programmable controller) intelligent control, equipped with product process data input, storage, touch screen, and has an ideal and flexible man-machine dialogue interface. The imported electrical and hydraulic components enable the two systems to basically operate without problems, and the advanced random detection control system realizes remote control and fault diagnosis. The hydraulic system design with perfect technology and well-made hydraulic components is optimized. The independent integrated hydraulic station avoids the influence of the host vibration and dust on the hydraulic system, thus ensuring the reliability of the hydraulic system. Pure vertical table mode resonance, fully automatic frequency modulation and amplitude modulation, truly realizes "one machine multi-energy". By simply changing the mould, the product production can be quickly adjusted to maximize the market's demand and maximize the effectiveness of the equipment. Particular storage and discretion material system insure the feeding accuracy and avoiding the effect of exterior material. The Multifunction Chirag Next-Gen Concrete Block Making Machine forming machine is newly developed by our company, is a special equipment for producing building blocks. The machine can use fly ash, slag, coal gangue or other industrial waste residue and river sand, gravel, cement and other materials to produce hollow blocks, perforated bricks, curbs, pavers and grasses of various specifications by changing the mould. Concrete products such as bricks, ring tree bricks, and slope protection bricks. Plus fabric fabrics can also produce layered products. The main frame of Multifunction Chirag Next-Gen Concrete Block Making Machine forming machine adopts detachable vertical double frame structure, which is made of super large and strong steel. It is strong and vibration resistant and has good reliability. It adopts indenter and stripping double clamping method to ensure reliable movement of product removal and swaying. The structure, the fabric is fast and uniform, the product strength error is very small, the stability is high, and the scrap rate is low. The Multifunction Chirag Next-Gen Brick Making Machine forming machine is newly developed by our company, is a special equipment for producing building blocks. The machine can use fly ash, slag, coal gangue or other industrial waste residue and river sand, gravel, cement and other materials to produce hollow blocks, perforated bricks, curbs, pavers and grasses of various specifications by changing the mould. Concrete products such as bricks, ring tree bricks, and slope protection bricks. Plus fabric fabrics can also produce layered products. The main frame of Multifunction Chirag Next-Gen Brick Making Machine forming machine adopts detachable vertical double frame structure, which is made of super large and strong steel. It is strong and vibration resistant and has good reliability. It adopts indenter and stripping double clamping method to ensure reliable movement of product removal and swaying. The structure, the fabric is fast and uniform, the product strength error is very small, the stability is high, and the scrap rate is low. The Multifunction Chirag Next-Gen Paver Block Making Machine forming machine is newly developed by our company, is a special equipment for producing building blocks. The machine can use fly ash, slag, coal gangue or other industrial waste residue and river sand, gravel, cement and other materials to produce hollow blocks, perforated bricks, curbs, pavers and grasses of various specifications by changing the mould. Concrete products such as bricks, ring tree bricks, and slope protection bricks. Plus fabric fabrics can also produce layered products. The main frame of Multifunction Chirag Next-Gen Paver Block Making Machine forming machine adopts detachable vertical double frame structure, which is made of super large and strong steel. It is strong and vibration resistant and has good reliability. It adopts indenter and stripping double clamping method to ensure reliable movement of product removal and swaying. The structure, the fabric is fast and uniform, the product strength error is very small, the stability is high, and the scrap rate is low. The Multifunction Chirag Next-Gen Hollow Block Making Machine forming machine is newly developed by our company, is a special equipment for producing building blocks. The machine can use fly ash, slag, coal gangue or other industrial waste residue and river sand, gravel, cement and other materials to produce hollow blocks, perforated bricks, curbs, pavers and grasses of various specifications by changing the mould. Concrete products such as bricks, ring tree bricks, and slope protection bricks. Plus fabric fabrics can also produce layered products. The main frame of Multifunction Chirag Next-Gen Hollow Block Making Machine forming machine adopts detachable vertical double frame structure, which is made of super large and strong steel. It is strong and vibration resistant and has good reliability. It adopts indenter and stripping double clamping method to ensure reliable movement of product removal and swaying. The structure, the fabric is fast and uniform, the product strength error is very small, the stability is high, and the scrap rate is low. We are manufacturers and suppliers Chirag Multi-Purpose Block Machine of Especially designed using best grade raw materials and advanced technology. These are equipped with all the necessary accessories making them easy to operate. 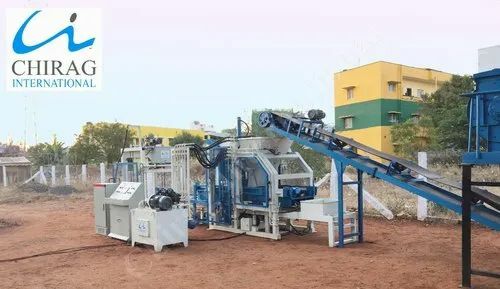 Chirag Eco Friendly Multifunction Block Machine offered by us can be used for making all types of construction material such as fly ash brick, concrete block, interlocking brick, interlocking block, interlocking paver etc. This model has been applied for the patent protected by state laws, counterfeiting is not allowed (Patent No.201220242625.7). Chirag Multi-Speed Block Making Machine offered by us can be used for making all types of construction material such as fly ash brick, concrete block, interlocking brick, interlocking block, interlocking paver etc. We take pride ourselves in offering a wide range of Chirag High Grade Hydraulic Block Machine to our clients. Our range is immensely used for making blocks for construction purposes. These are well known for its features like sturdy construction, durable finish, easy operations and low maintenance. Chirag Next-Gen Hollow Block Machine offered are made available in compliance with defined industry standards and is based on advanced process technology as well as use of premium components that make these match up to the process needs of the customers. We make these machines available with wheel support that allows their easy movement after laying of block on concrete floor to next laying space. Moreover, our products are competitively priced for easy affordability to our precious clients. This model has been applied for the patent protected by state laws, counterfeiting is not allowed (Patent No.201220242625.7). Use movement sensors (electronic slide rule) to control the precise movement between the tamper head and the mould. Fitted with special hydraulic loading unit, readily realize mass and automatic production, saving a great deal of human power, maintenance field, and circulating fund investment. Enlarge the available area of the work table: The appliance of the advanced vibration technology causes the larger work table, it makes that the productivity is increased greatly. Looking for “Multifunction Chirag Next-Gen Block Machine”?